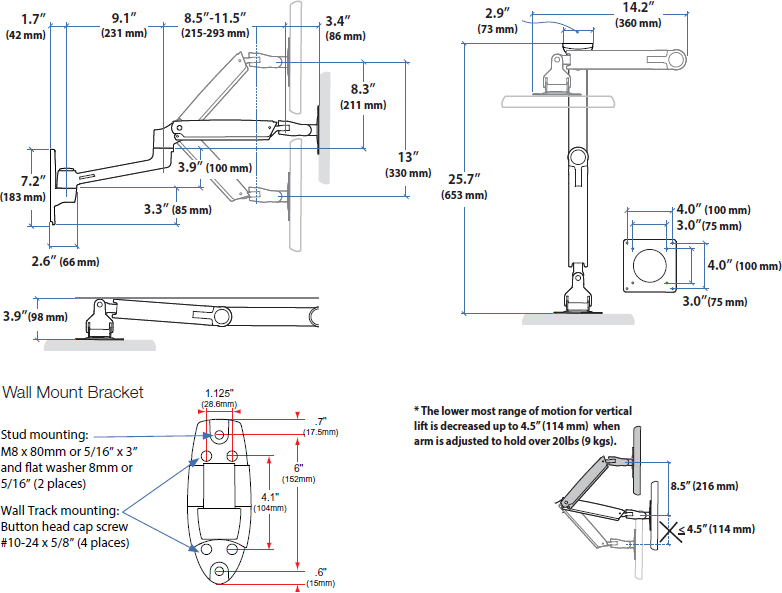 Looking for a Long Reach Wall Mount Monitor Arm? LX Notebook Tray Can be configured to hold a laptop instead of an LCD display; also order the LX Notebook Tray (50-193-200). Quality Tested 10,000-cycle test applied to lift mechanism, ensuring years of trouble-free height adjustment. Question: I am looking for an arm just like this but with a keyboard mouse tray underneath the monitor. Do you have an attachment for the monitor which will accommodate a keyboard mouse tray with the monitor? Answer: You have a couple of options. This particular arm does not have an attachment for a keyboard tray but you can install a keyboard tray arm underneath this arm. Or you can purchase an all in one system. Question: I notice that there are a bunch of extra add-ons with this product. Will I be able to hang a 24" monitor if I just buy this wall mount monitor arm or do I have to buy a bracket? Answer: As long as you have studded walls, you do not need any additional accessory to mount this arm to the wall. When you buy this product, it comes with a wall mount bracket, that will attach the arm to the wall. Unlike many other arms, these stay where you put them. Here we have had others that were less expensive but they were either raising or lowering the screens by themself. The wall mount is well made and not bulky. This product has a great finish, and the quality/price is good! Two of these mounts were purchased for use in dental treatment rooms for patients to view video entertainment while being treated. They are well built and look professional. They installed easily and worked perfectly. The mount allows great flexibility of movement except we would have liked to be able to tilt it downward more. Definitely recommended. Good wall mount. It is made out of durable material. It can be a bit difficult to re-adjust but that is with an extension arm and 23" monitor. The product does what it's supposed to do. Only thing I have trouble with is that I would like more wire space in the arms because some setups might have more than two wires.